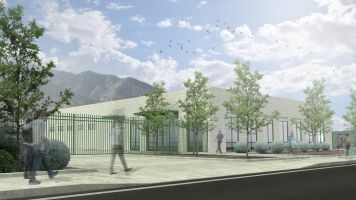 The planned biosafety-level 3 plant facility in Riverside. The CCRF has a variety of laboratories and specialized research spaces for plant research. In addition, we will work with you to accommodate specialized equipment needed for your project. Rental of any CCRF research spaces includes the use of common areas such as autoclaves, change corridors, RO water, and support spaces as needed. Also included is the use of the core is shared laboratory equipment, for example: refrigerators, -80°C freezers, cryofreezers, fume hoods, biosafety cabinets, growth chambers, lyophilizers, vortexers, microcentrifuges, and -20 degrees Celsius freezers. All BSL-3 spaces have biocontainment enhancements beyond minimum published requirements and standards of the Biosafety in Microbiological and Biomedical Laboratories (BMBL) and NIH Guidelines. The CCRF has two Conviron E8 Growth Chambers customizable for plant growth and arthropod maintenance. These versatile chambers facilitate complete computerized and programmable control of temperature, lighting, and humidity as required for plant growth and rearing needed per project. In addition to environmental parameters, options are also available for growth height and refrigeration configurations. Research Support and assistance is provided throughout the application process, permits, and any assistance throughout the duration of the project. The CCRF is committed to the success of your research. The CCRF’s research support team will work with you to evaluate your research needs in our modern, state-of-the-art facility. This team is experienced in developing safe research procedures and navigating pertinent rules and regulations throughout the process. Available to you are facilities, infrastructure, and support services to assist you in your research every step of the way.